This new method of using only urea and terbinafine creams seemed to be working well, since I got to cut this toenail normally for the first time in 10 years. And here is what the nails looked like before. Awful! However, take a look at the right big toenail in the first picture. It looks good from a distance, but if you look up close you can see that the actual pink part attached to the nail bed was creeping closer and closer to the cuticle. So this started some doubt in my mind that maybe this wasn’t the best formula. Thank you for your extremely helpful guide. I’ve been at it for a year now and find it an extremely slow process. Do you find your toe nails grow extremely slow? I started out with a mixture of tea tree oil and oregano oil. It was definitly working, but if I missed a moment of treatment, I felt the setback. The oil of oregano burned the skin pretty bad around my nails and caused considerable redness and peeling. While researching this topic as I routinely do, I came across a new homeopathic oil and have been using it now for about 6 months (along with Kerasal too). Cinnamon oil. It is working and the progress is about the same as with the other oils…slow but steady. My nails hardly grow. Have you heard of using pure Ceylon cinnamon oil for nail fungus? (I also read that natural treatments as we are all doing can take up to 3 years sometimes for a stubborn case. Ugh). I have pretty slow growing toenails, but I think that that is pretty normal. I have gotten to the point where I make treating my toenails part of my daily regimen, and I have gotten over being anxious and impatient. I have seen the cinnamon oil marketed for nail fungus as you mentioned. This might be beneficial for people who have allergic reactions to other oils, but I do believe that it is a very strong oil. Hi! I find your story very interesting and inspiring! I struggled with toenail fungus on my big toes for more than 10 years. My nails were yellow, brittle, dry, thick, and with an “oil slick” discoloration. They weren’t as severe as yours but I was so sick of them and felt ashamed of my toes. I tried kerasal nail and even went to a podiatrist who prescribed me topical nafcillin which I diligently used for months without results. Finally I cut down my nails as far as they would comfortably go and then filed them to thin them out. I used hot soaks of water, apple cider vinegar, and tea tree oil a few times per week and then applied tea tree oil after they were dry. I would moisturizer with coconut oil after showers as well. I tried to go shoeless as much as possible. I stumbled upon your website at that time and enjoyed seeing your trials and progress. It has been about 1 year since I have cleared the nail fungus after all that time!!! I couldn’t be happier. I love staring at my toenails and I feel so proud that I cured the problem myself and naturally! Good luck and I look forward to more positive results for you. I think it is great that you share your story to help others. It’s so nice to find another person who has successfully gotten rid of nail fungus! Thanks for sharing your accomplishment. 🙂 I am interested to know if you have a maintenance routine now. Can the antifungal cream be 1% Tolnaftate instead? Is there a specific reason you chose the one you did or will any antifungal/athletes food cream work? I have experienced allergy issues with the other. There’s no specific reason. I just randomly chose it from the variety of different antifungal products out there. Tolnaftate might work just as well but I can’t say for sure. If you try it out please come back and let everyone know how it worked. Hi John, wow your nails look great! I just started doing your urea and terbinafine cream treatment today and I hope my nails can improve as much as yours have! I am so happy to have stumbled on your website! 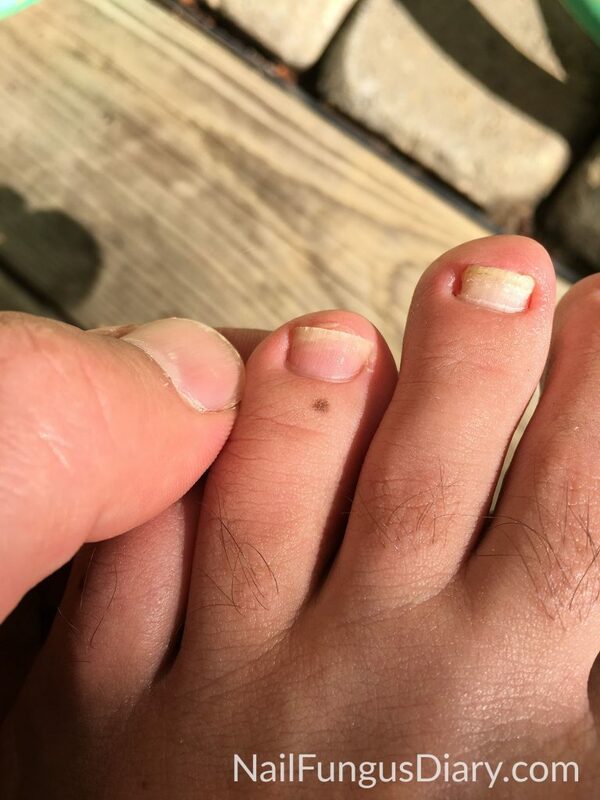 I had a pinky toe infected with fungus in 2010 and it’s now spread to all but four toenails. I have been using lamisil topical off and on since 2010 and was about it the last four months, however it doesn’t seem to be doing a darn thing. I’ve ordered the products and can’t wait to try them out. I think softening the nail is going to be key. I do have TTO and oil of oregano and coconut oil so I’ll use that while I wait for delivery of urea, etc. thankfully I’m on maternity leave until next march so I’ll be home and be able to spend lots of time barefoot. Thank you, John, for this gold mine of a blog. 1: I am unsure if kerasal nail or urea cream will be the right approach- some things I’ve read sound like the kerasal causes the nail to fall off, and I wonder a) is that true? and b) since only a sliver on both sides of my nails are affected, would causing the nail to fall off really be the way to go? I could see if the entire nail was affected this could be a good idea, but for my case it seems iffy. 2: with your urea cream + terbinafine approach, do you allow the urea cream to soak in for some time, or are you basically mixing the two creams on your nail before the urea cream has absorbed? Many thanks for all your help and hard work. And good luck with your nails! Hi! Here are my thoughts. First, I think a neglected aspect of my treatment has been making sure that my feet stay dry when I have socks and shoes on. Those outer edges of the big toes are the hardest to treat, and I think it’s because they have the largest lateral nail folds of any of the toes. That’s the portion of skin to the left and right of the nail. It’s really deep and I think it’s easy for sweat to build up in there and ruin your efforts. I have been struggling with those two big toes even as the others are doing well. This month I have been dusting my feet with foot powder and changing my socks in the middle of the day. I’ll report on my results soon. 1. I have never had a nail fall off for any reason. 2. I apply them both at the same time, and just rub it around to mix. Nothing fancy. You, sir, are the example of what’s best on the internet. Brilliant! Hi, yes they have been growing faster and faster as the treatment has progressed. I will definitely be watching out for the sides of the nails, they are the hardest part to deal with for sure.